Meteorological station on East Peak road in the Elfin Forest of the Luquillo Mountains, Puerto Rico. A key feature of the LEF's ecosystems is disturbance. 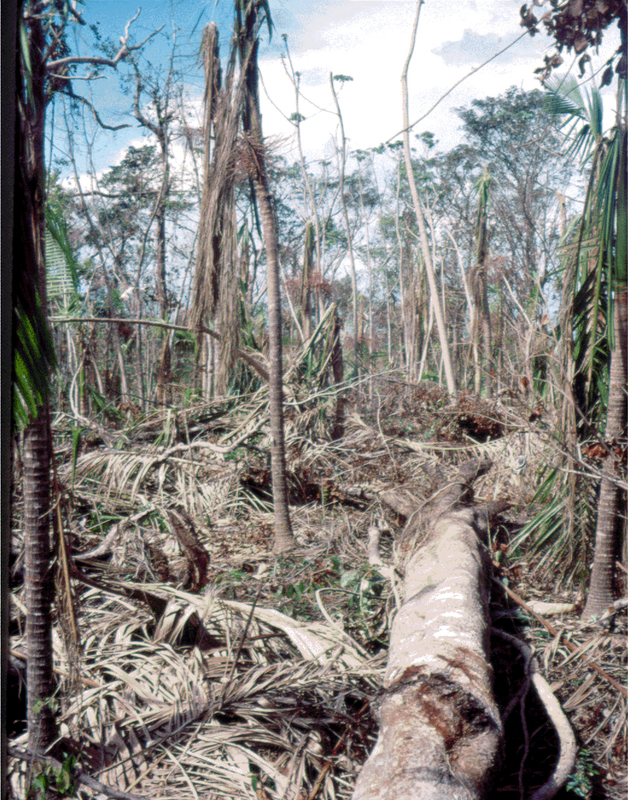 Hurricanes, landslides, and human disturbance have shaped the forest, and research by LUQ has stimulated a new appreciation of the significance of large-scale disturbances in tropical forested ecosystems and the key role of plants and animals in shaping the response to these events (see Disturbance and Recovery, Landslides, Forest Dynamics). Hurricanes occurring one and 10 years after LUQ began in 1988 provided landscape-scale natural experiments which are still followed closely. How do climatic factors, litter quality, and detritivore diversity regulate decomposition of detrital pulses? How do terrestrial and aquatic food webs differ in their response to detrital pulses? What is the effect of disturbance frequency on nutrient cycling, plant community composition, and the accumulation of soil organic matter? To what degree is the export of carbon and nutrients from watersheds a result of soil characteristics that are affected by detrital dynamics? How do elevationally related changes in climate impact plant and detritivore communities, and how do these feed back on the quantity and quality of litter inputs and decomposition? Examining the degree to which species and functional groups contribute to detrital dynamics and the ability of an ecosystem to recover following disturbance. By extending an understanding of the LEF to other disturbance-driven systems, LUQ is making significant contribution to our knowledge of the mechanisms by which disturbance structures ecosystems. 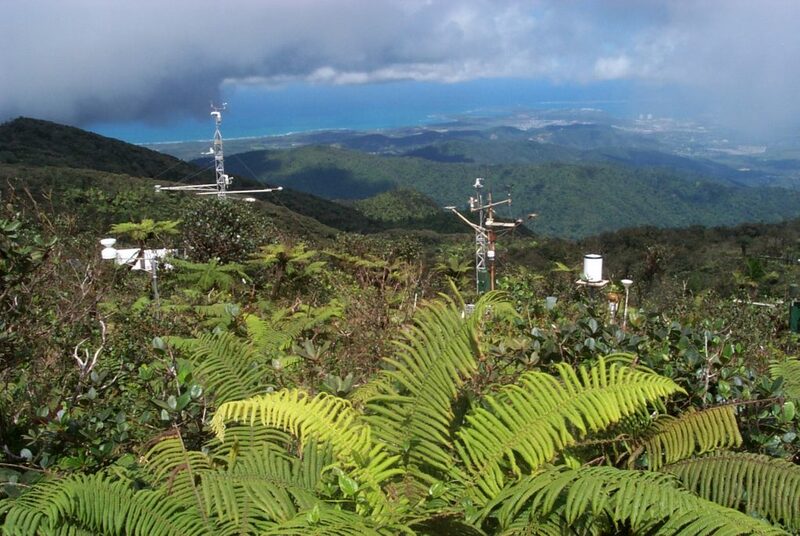 The Luquillo Long-Term Ecological Research (LUQ) program takes place in the Luquillo Mountains of Puerto Rico. This tropical setting has steep environmental gradients, a varied natural disturbance regime, and a history of human land use. Of the mountain area 11,330 hectares are included in the Luquillo Experimental Forest (LEF), which is congruent with the Caribbean National Forest, part of the U.S. National Forest system. The mountains rise to over 1075 m. Prevailing winds coming off the ocean from the east drop rain as they rise over the mountains; thus rainfall increases with elevation, ranging from about 3530 mm year-1 at low elevations to 4850 mm year-1 higher up. February through April are the drier months, but monthly rainfall is variable. Mean monthly temperatures at lowest elevations range from about 23.5ºC in January to 27ºC in September, and at the highest elevations from 17ºC to 20ºC (see article Climate and Hydrology in this web page). The Luquillo Mountains are composed mainly of igneous rock formed in the Cretaceous, with some intrusive materials from the Tertiary (see Geology). Soils are deep, weathered, and moderately rich in nutrients. Little humus accumulates, due to rapid decomposition, except in local areas at upper elevations, where decomposition seems to be inhibited by waterlogging. Nutrient pools in the soil are typically equal to or greater than those in the aboveground biomass, except for phosphorous, of which more is in plant biomass than in soil. Soil nutrients are not necessarily available to plants. For example, low oxygen availability in the waterlogged soils of high-elevation cloud forests may decrease rates of decomposition and nutrient uptake by roots. There are four main life zones, delineated on the basis of temperature and precipitation (Holdridge System), in the Luquillo Mountains: subtropical wet and subtropical rain forests are found at low and mid elevations, lower montane rain and lower montane wet forests at high elevations. There is also an area of subtropical moist forest at low elevations on the southwest slope. The forests are classified into four types. 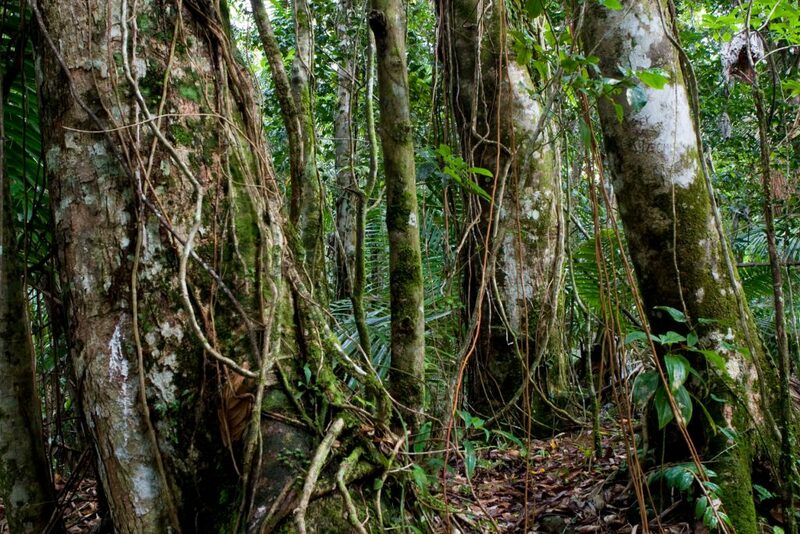 "Tabonuco forest", so named for the dominant "tabonuco" tree (Dacryodes excelsa), covers lower slopes to about 600 m. In well-developed stands the larger trees exceed 30 m in height, there is a fairly continuous canopy at 20 m, and the shaded understory is moderately dense. Tabonuco trees are especially large on ridges, where they are firmly rooted in the rocky substrate and connected by root grafts with each other. There are about 168 tree species in the tabonuco forest. The "colorado forest", named for the large "colorado" tree (Cyrilla racemiflora), begins above the tabonuco forest and extends up to about 900 m. Its canopy reaches only about 15 m. Soils are saturated and root mats above the soil are common. There are some 53 tree species in this forest type. At this same elevation, but in especially steep and wet areas, is "palm forest", heavily dominated by the sierra palm, Prestoea acuminata. Patches of palm forest are also found in saturated riparian areas in the tabonuco forest. The palm forest reaches about 15 m in height. At the highest elevations is "dwarf forest", a dense forest as short as 3 m, on saturated soils. Here the trees are covered with epiphytic mosses and vascular plants, especially bromeliads, and these also cover large areas of the ground. Ascending the Luquillo Mountains through these forest types, the average tree height and diameter, number of tree species, and basal area (cross sectional area of tree stems) tend to decrease, while stem density increases. 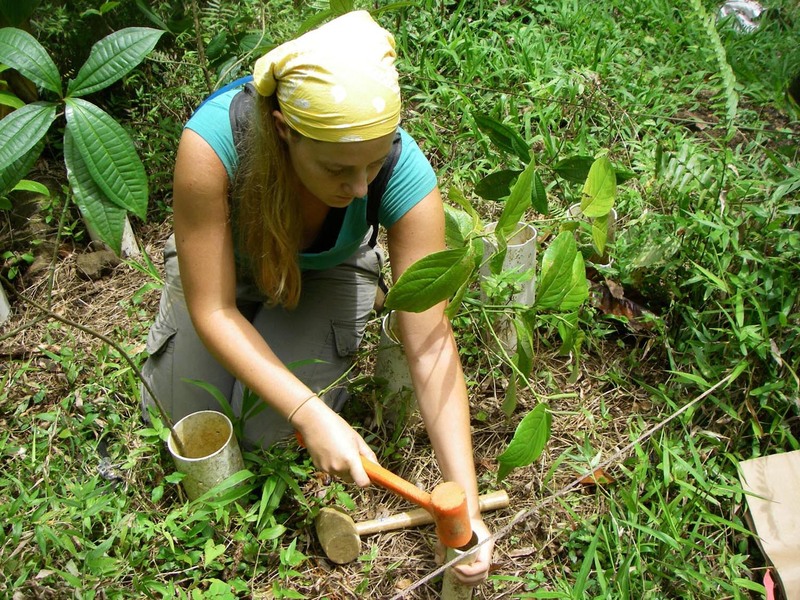 Epiphytes become more common with elevation Much plant, animal, and ecosystem research has taken place in tabonuco forest near El Verde Field Station, operated by the Institute for Tropical Ecosystem Studies of the University of Puerto Rico. El Verde is at 350 m elevation, with mean rainfall 3450 mm per year. The soils are of volcanic origin. Work on the plant community at El Verde has focused on the 16-ha Luquillo Forest Dynamics Plot (LFDP; see Forest Dynamics). There are 89 tree species ³ 10 cm diameter in the LFDP. The commonest are Prestoea acuminata, Casearia arborea, Dacryodes excelsa, Manilkara bidentata, Inga laurina, and Sloanea berteriana. The commonest shrubs are Palicourea riparia, Psychotria berteriana, and Piper glabrescens. Grasses, ferns, and forbs are frequent on the ground, especially in canopy gaps; epiphytes are fairly common, and vines are uncommon. The Bisley Experimental Watersheds are another main LUQ study area in tabonuco forest. 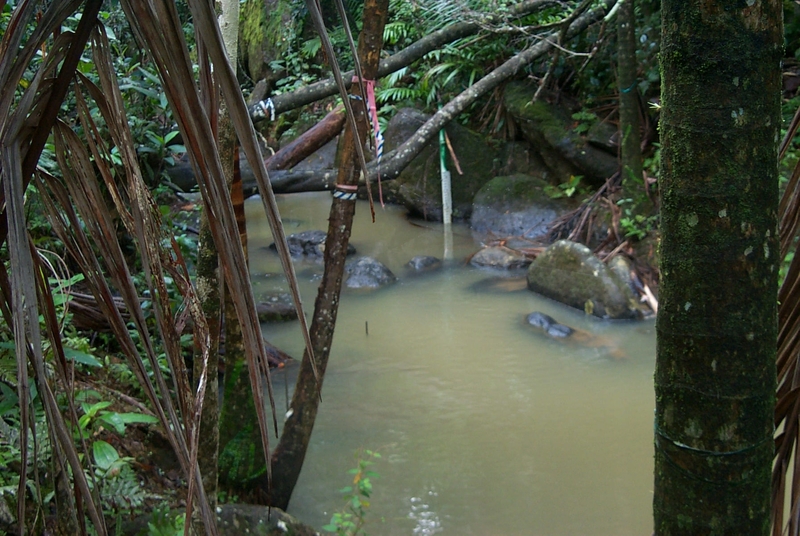 At El Verde, Bisley, and elsewhere in the mountains LUQ also conducts intensive sutdies on stream ecology (see Streams). The Luquillo Mountains support a high biomass of lizards and frogs (see Food Web). Native mammals include bats; rats, cats, and mongooses are introduced. Birds include several species endemic to Puerto Rico, such as the Puerto Rican Tody, an understory insectivore, and the Puerto Rican Parrot, an endangered species. Walkingsticks, which are herbaceous insects resembling short twigs, and snails are fairly common. Streams support shrimps and aquatic insects. 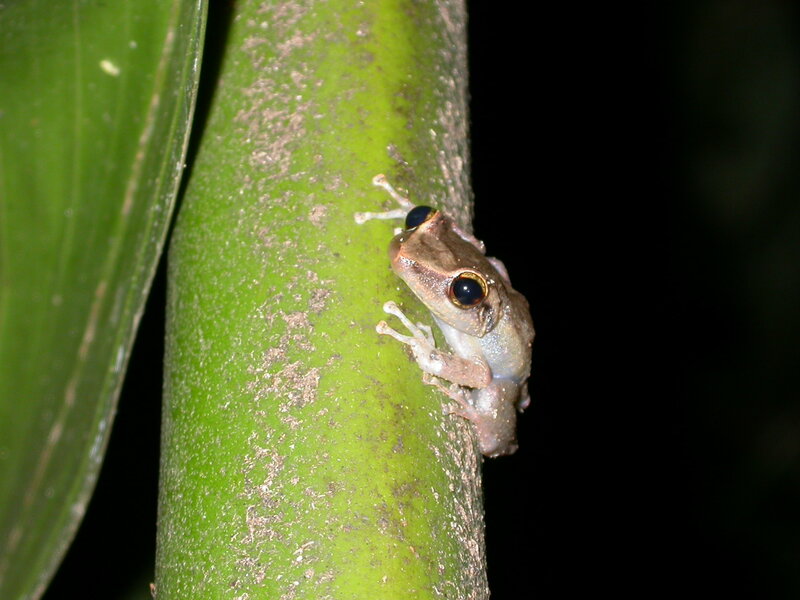 The compositon and diversity of animals differs between Puerto Rico and temperate zone forests and mainland tropical forests. 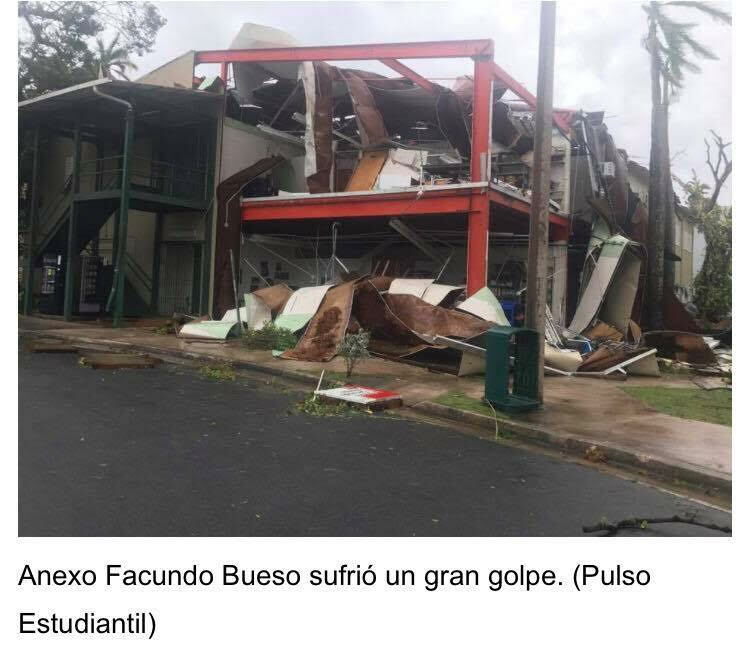 Natural disturbances in the Luquillo Mountains include hurricanes, landslides, treefalls, droughts, and floods. Human disturbances, mainly in the past, include road construction, charcoal production, clearing for pasture and crops, creation of coffee plantations, and logging. In general the forest recovers more quickly after natural than after human disturbances (see article: Disturbance and Recovery). 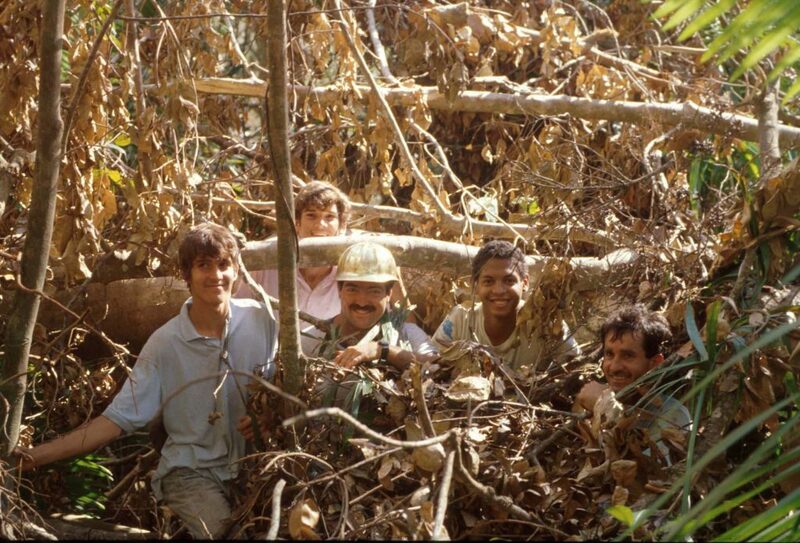 The Luquillo Experimental Forest (LEF) Long-Term Ecological Research Program began in 1988 with the goal of integrating studies of disturbance regime and forest structure and dynamics with a landscape perspective. Two central research questions addressed 1) the relative importance of different disturbance types within the four tropical rain forest life zones of the LEF and 2) the importance of the biota in restoring ecosystem productivity after disturbance. 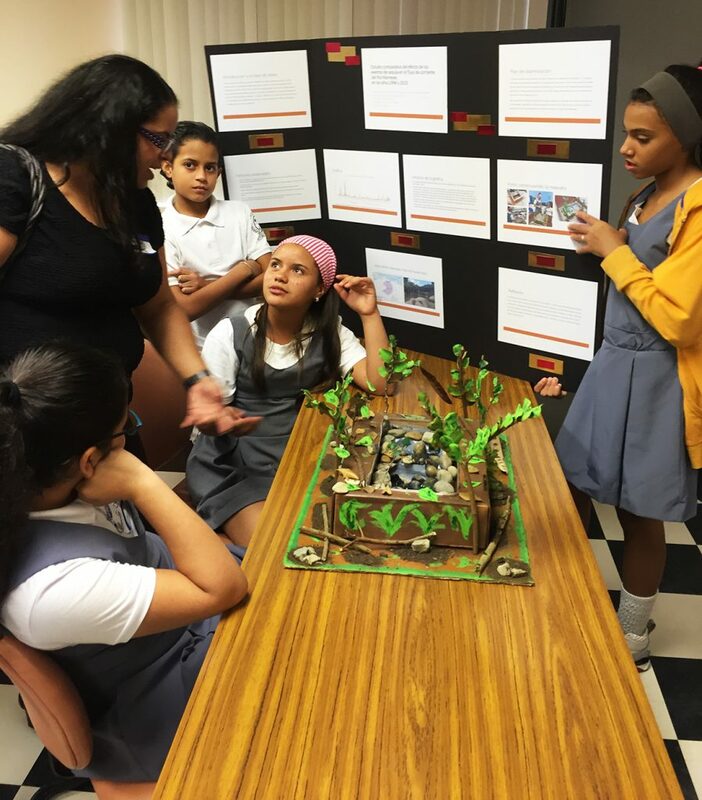 The long-term monitoring program initiated as part of the Luquillo LTER was critical to the evaluation of immediate and subsequent effects of Hurricane Hugo, which struck Puerto Rico in 1989. 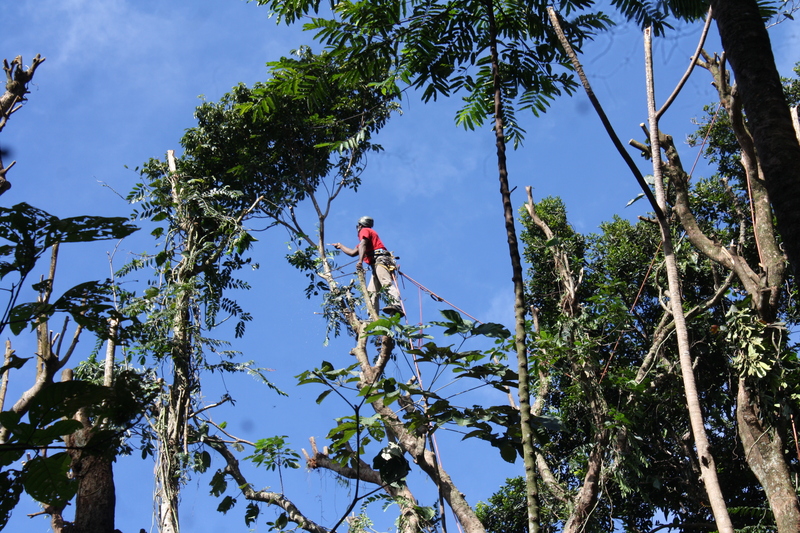 The occurrence of a hurricane soon after the initiation of the LTER program provides an opportunity to study the long-term dynamics of a tropical forest as it recovers from a major disturbance. Emphasis on the impacts of hurricanes and human disturbances on ecosystem dynamics of the LEF continued in LTER 2. Further attention was directed at deciphering interactions among the biota and their impact on critical ecosystem variables that determine responses to natural disturbances. 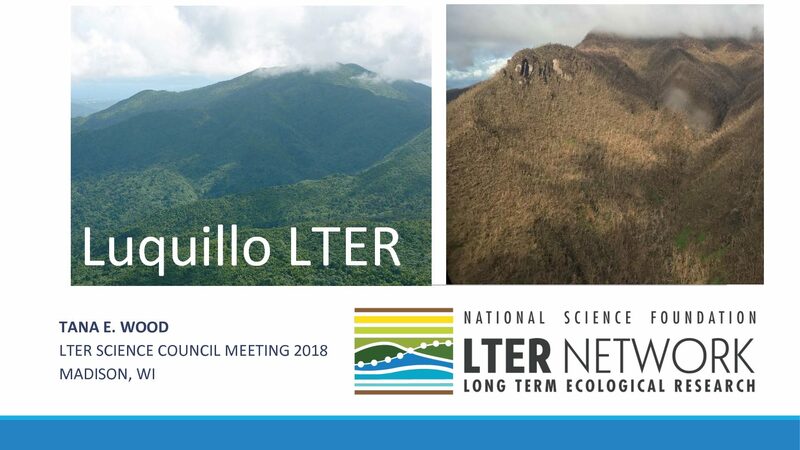 New initiatives expanded the comprehensive analysis of disturbance and ecosystem response to include elevations up to the summit of the Luquillo Mountains. In the LTER 3 proposal, we combined long-term measurements, field experiments, simulation modeling, and cross-site comparisons to address five questions: (1) How do climatic factors, litter quality, and detritivore diversity regulate decomposition of detrital pulses? 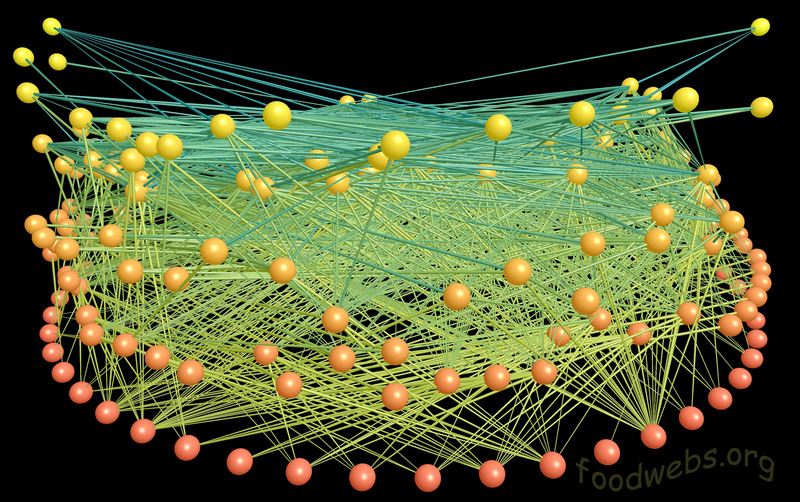 (2) How do terrestrial and aquatic food webs differ in response to detrital pulses? (3) What is the effect of disturbance frequency on nutrient cycling, plant community composition, and the accumulation of soil organic matter? (4) To what degree is the export of carbon and nutrients from watersheds a result of soil characteristics that are affected by detrital dynamics? (5) How do elevationally related changes in climate impact plant and detritivore communities, and how do these feed back on the quantity and quality of litter inputs and decomposition? Through our focus on disturbance and detrital dynamics, we build on existing strengths in integrating community and ecosystem ecology and the research opportunities provided by infrequent, large-scale disturbance, high diversity, and pronounced elevational gradients in the LEF. Our research is being conducted in two spatial contexts. In mid-elevation tabonuco forest, we will continue long-term measurements of ecosystem response to hurricanes, landslides, and anthropogenic disturbance. Long-term measurements of hydrological and nutrient fluxes in watersheds will relate soil characteristics to stream nutrient and organic matter losses and provide information to gauge the effects of future disturbances. Simulation models of key population, community, biogeochemical, and landscape processes provide null-model predictions to inform these new observations and experiments. Can an ancient ocean shoreline set the stage for a tropical forest of today?